On Monday afternoon, former President George H.W. 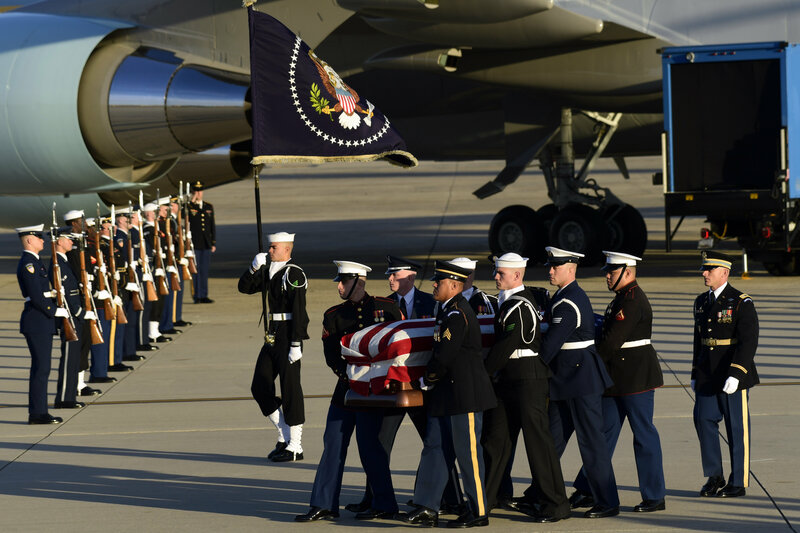 Bush was carried in a flag-draped coffin from Houston, Texas, to Joint Base Andrews in Maryland, just outside of Washington, DC, aboard a plane that serves Air Force One. The president will lie in state in the US Capitol Building for three days. Bush, who served as the 41st president of the United States from 1989 to 1993, died at the age of 94 on Friday. In late April, he was taken to hospital with an infection that spread to his blood, soon after the funeral of his late wife Barbara Bush. He was suffering from Parkinson's Disease and couldn't walk on his own, instead relying on a wheelchair and a stroller. Members of the Bush family, including former President George W. Bush, former first lady Laura Bush and former Florida Governor Jeb Bush, as well as a special honor guard, greeted the former's president casket as it was lifted from the plane to the strains of "Hail to the Chief" Monday afternoon. The special honor guard also performed other traditional fanfare including "Four Ruffles and Flourishes" and a 21-gun salute. The casket was then driven in a presidential hearse to the US Capitol in Washington, DC, where an arrival ceremony took place in the Capitol Rotunda. 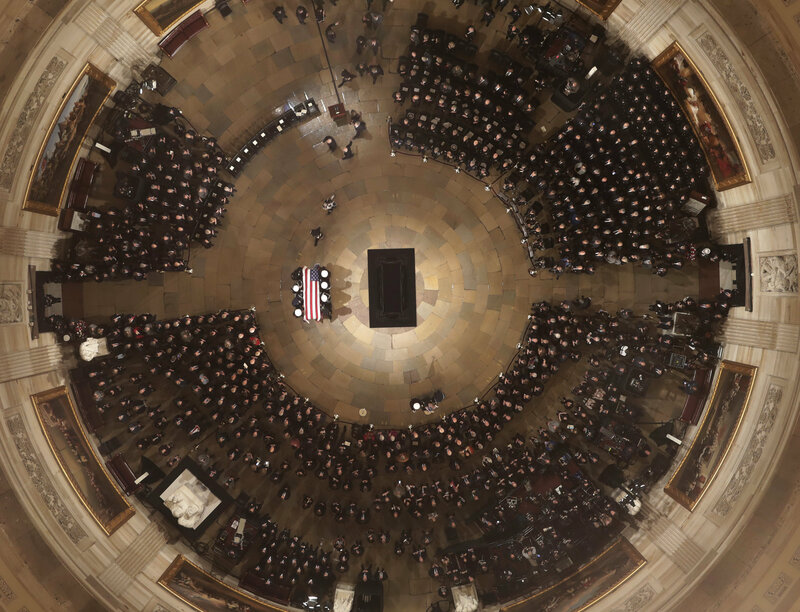 At around 5 p.m. local time, officials including Vice President Mike Pence, House Speaker Paul Ryan and Senate Majority Leader Mitch McConnell, paid their respects to the former president during a short service. McConnell called Bush a "steady hand staying the course" over his public service, while Ryan said that the president taught him that "in a democracy, sometimes you fall short," and how you handle those shortcomings "is just as important as how you win." Pence noted that Bush "never failed to answer the call to serve his country." The former president's remains will lie in state at the Rotunda until Wednesday, and members of the public may pay their respects by entering through the Capitol Visitor Center starting Monday at 7:30 p.m.
​A funeral service has been planned for Wednesday at the Washington National Cathedral. US President Donald Trump is expected to be in attendance. "Looking forward to being with the Bush Family to pay my respects to President George H.W. Bush," Trump tweeted Monday. Former presidents Barack Obama, Bill Clinton, Jimmy Carter and George W. Bush will also be in attendance. "We'll be spending three days of mourning and three days of celebrating a really great man's life," Trump said about Bush's funeral while in Argentina this weekend attending the G20 summit. "So, we look forward to doing that, and he certainly deserves it. He really does. He was a very special person." On Thursday, Bush's remains will be flown back to Houston for a funeral at the St. Martin's Episcopal Church in Houston. The burial is scheduled to take place later that day at Bush's presidential library on the campus of Texas A&M University in College Station, located about 100 miles northwest of Houston, according to reports. According to Stars & Stripes, Bush's service dog, Sully, who has been with the former president since June, will now help wounded soldiers through the facility dog program at the Walter Reed National Military Medical Center in Bethesda, Maryland. ​On Sunday, Bush's spokesperson, Jim McGrath, posted a photo of the Labrador next to a flag-draped casket with the caption, "Mission Complete."